Habitat: White horehound is probably native to the Mediterranean countries but can be found growing wild in many places in central and southern Europe, northern Africa, and much of Asia. In Asia, it grows in the western temperate regions of the Himalayas, Kashmir, north-western India, southwestern Pakistan and southeastern Iran. It has been introduced and has become naturalized in many countries around the world with suitable climate. Horehound is easy to cultivate and can be propagated by seeds or cuttings. The plant thrives in a nutrient-poor soil in sunny and dry habitats. Like most plants in its family, it can flourish in wastelands and can be commonly found along roadsides. Description: White horehound is an herbaceous perennial plant with grayish leaves, and grows to an average height of 33 cm. The leaves are 3 to 5 cm long with a hairy texture. The flowers appear on the upper portion of the main stalk in small white clusters. The plant has an odd musky smell which lessens with dehydration. Plant Parts Used: The young shoots and the leaves are the most commonly used parts of the white horehound. The above-ground parts of the plant are collected when it’s in bloom. The herb is used fresh or dried for later use. It is used in the form of liquid extract, tinctures or powder. In the past, the herb was mostly collected from the wild but today it is cultivated for commercial use in Hungary, Poland, Germany, Canada, and Finland. White horehound contains bitter diterpene lactones (0.3-1%) such as marrubiin. In addition, it contains alkaloids, choline, essential oil (0.05 to 0.06%), flavonoids, tannins (up to 7%), mucilage, resins, minerals (particularly potassium) and vitamin C . Marrubiin is the main active ingredient in terms of expectorant properties and bitter effects. White horehound is an anti-inflammatory herb and it is used to treat coughs, and other respiratory ailments such as bronchitis, whooping cough and asthma. 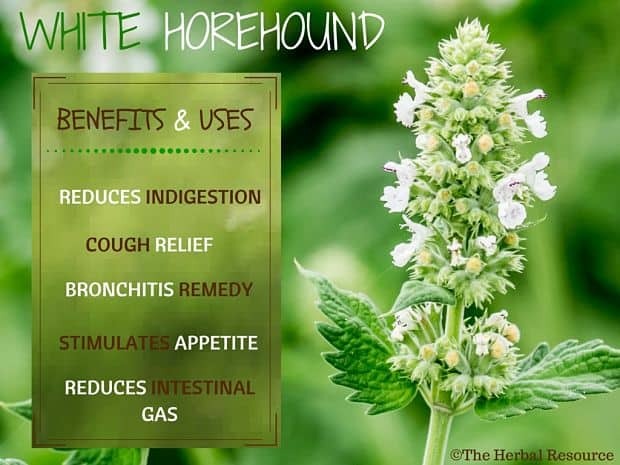 White horehound has also expectorant properties and can be used to loosens phlegm to produce a more effective cough by soothing the tissues in the bronchial pathway allowing mucus to be expelled with ease. 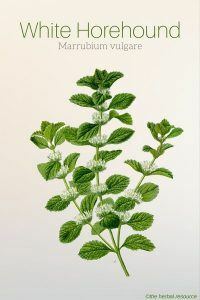 As a treatment for coughs and bronchitis, white horehound is often combined with other herbs such as hyssop (Hyssopus officinalis) and coltsfoot (Tussilago farfara). 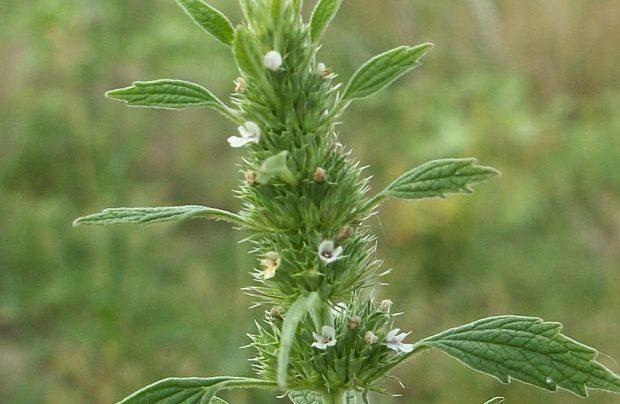 The digestive system is affected by taking white horehound by means of the liver and the spleen. The plant can reduce indigestion, bloating and other gastrointestinal problems. It increases the flow of bile which helps the function of the gallbladder. It’s the presence of the substance marrubiin that is responsible for the extremely bitter taste of the herb and makes it act as an appetite stimulant. Commission E in Germany has approved the uses of white horehound for loss of appetite and digestive ailments such as bloating and excessive intestinal gas. Research is underway to investigate the plant’s ability to lower blood sugar levels, possibly making it an effective treatment for diabetes. It’s already administered for diabetes treatment in some countries, including Mexico. Preliminary studies have indicated that white horehound can potentially act as a stabilizer for heart rhythm and that the root of the plant is an active natural remedy for rattlesnake bites. Current research is aimed at determining how well this plant can be used against other illnesses, such as cancer and leukemia. One of white horehound uses as a folk remedy is to relieve pain. It has been promoted as an effective treatment for sprains, toothaches, and headaches. It is also widely recommended by practitioners of herbal medicine to help relieve muscle cramps and swelling, including the pain and swelling associated with menstrual cramps. Marrob, the Hebrew name for white horehound, is one of the five sacred herbs traditionally served at Passover feasts. White horehound is mostly used as a herbal tea. When making a tea a ½-1 teaspoon of the dried herb can be used in one cup of boiling water and soak for 10-15 minutes before it is strained. The daily dosage often recommended by herbalist to reduce a sore throat and loosen phlegm is one cup three times a day and this corresponds to an intake of approximately 4.5 g of dried herb. More demanding applications require higher concentrations and should be then used less frequently. When the herb is used in tincture form the recommended dosages are often 2.1 ml per day of a 1: 5 tincture in 40% alcohol. For all commercial products containing white horehound, the manufacturer’s instructions should be followed. Studies suggest that the usage of white horehound over an extended period of time may lead to high blood pressure. This plant should only be taken as needed and not on a regular basis. In large doses, the herb may cause irregular heartbeat so people with heart problems should consult a professional health care provider prior to use. The fresh plant has been known to cause skin rash in sensitive people. Dust from the dried herb can irritate the airways, so it might be a good idea to use a face-mask when processing the plant. White horehound is never to be used while pregnant or breastfeeding.